If you like, as I do, to administer your network from a workstation runnig Mac OS X and you enjoyed the installation of a VMware Server infrastructure, you will certanly will be disappointed to discover that THERE IS NOT a VMWare Console plug-in for Mac OS X version of Firefox or for Safari. 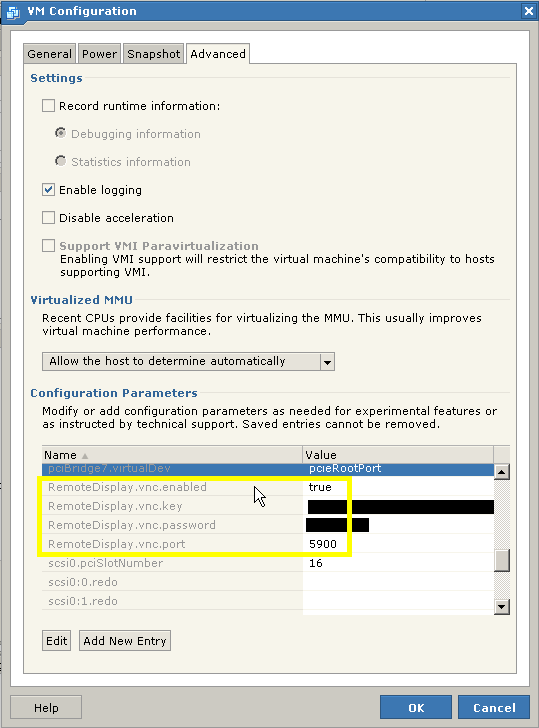 You still are able to access the VMware Infrastructure Web Access to create, modify, run and stop your virtual machines, but you will not be able to visualize the screen of virtualized servers unless you installed Remote Desktop, Terminal Service or other remotisation solutions suche LogMeIn or TeamViewer or a standart VNC server in the guest operating system. But what to do if you need to access the BIOS settings of your virtual machines, what if you need to access them in a pre-OS status in case there is some trouble with the OS? What if you are running a virtualized GNU/Linux server and you cannot access it via SSH service? The right solution came to my hand after a long time searching the web, and fortunately it’s fast and easy to apply and first of all is not tricky and unelegant like forwarding the X11 service via SSH (like many other blogs would suggest). run any VNC client pointing at <yourserver_domain_name>:5900 and you’ll be able to interact with your virtual machine from your Mac and even from you iPad or iPhone!!!! You are currently browsing the archives for the Virtualization category.